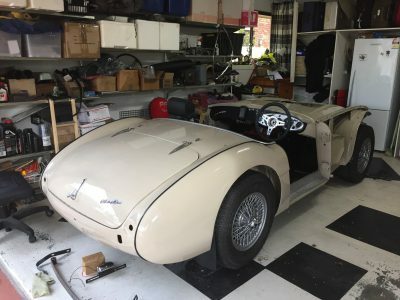 Ashton and Giles are preparing an Austin-Healey 100 for the Peking to Paris rally and are getting tantalisingly close to a running rally car. We’re joining the story well into the project, but Giles’ latest update will get you up to speed. Once again, since our last report, I am pleased to advise that we have made considerable progress, which is fortunate because we are now some 3 months behind our original schedule of having the car running by the 1st January 2018! However, now at the end of March, we are getting tantalizingly close to being on the road, and when you consider the many unexpected set backs and delays we have encountered along the way due to the poor condition of the chassis and bodywork, the unexpected rebuilding of the engine and gearbox, and the many issues with obtaining correct new parts, we have not done too badly. Shortly after fitting the engine and rebuilt gearbox, we found that the gearbox was jammed solid! We therefore had to remove it and return it to the people who had rebuilt it. It turned out that they had used too much gasket sealant and this had dropped down into the gearbox itself, and as it had just sat there for some 4 months, this had solidified, jamming the box. If we had installed the box and used it immediately there is a good chance we may not have had a problem, never the less this was a delay we didn’t need! We also had major dramas fitting the brakes because the wheel cylinders were slightly oversize and therefore the shoes wouldn’t fit inside the drums. This entailed time consuming emails with the supplier Denis Welch, and in the end we machined the end of the shoes very slightly in order to fit them. Unlike modern cars where parts just bolt on, there are so many variations in parts used in older cars that filing and machining seems to be a normal part of the rebuild process. Once the brake shoes were fitted, we then had dramas with the front drums. We had ordered 5-stud drums with the understanding that the later 2 ¼” drums we were changing to were all 5-stud, like the rear axle. Eventually we found out that the front hubs remained 4-stud, but even when we eventually got the correct drums in, we had to machine them because they wouldn’t fit correctly. At this stage we started to mend the cracks in the alloy front and rear shrouds, and found out that the green paint on the car was an enamel that couldn’t be painted over without bleeding into any new paint. This meant we had to strip every drop of green paint off every panel, which delayed us considerably because it was very time consuming, and if we had known about this earlier, we could have been doing the work steadily over the preceding months. While this was happening, most of the mechanical and major body repairs had been finally completed, so on the 14th February we moved the car out of Classic Car Clinic, its home for the past 9 months, and back to my house. I only have a “normal” two car garage, so basically we had to move our own cars out and dedicate the entire garage to the Healey! The next month was spent stripping off layer after layer of old paint and bog, and then replacing the old bog (that was up to a centimetre thick in places !) with new bog, and sanding it until an acceptable finish was achieved. I have not done this kind of body work since I was in my 20s, so like everything else on this car it was a steep learning curve for me. I had a friend who has a paint and panel shop come over to inspect my work before I took it for painting, and he declared that he would be quite happy if everyone presented their cars to him in such good condition! An excellent compliment after an exhausting, messy, and frustrating month. So with that I set off to find a suitable paint shop who could do the work as soon as possible. Darran at Gold Coast Panel & Paint, who had painted the chassis a few months ago, offered to do it over the following five days, which was perfect. When I picked up the painted panels, I was stunned – not only had they come up really well, but the Coronet Cream colour really sets off the classic flowing lines of the Healey, and with the black seats and interior trim, and using black rubber piping between the panels, it is really looking excellent. We are not looking for a concours finish because we are about to take the car to the wilds of the Australian Bush and then across the Gobi Desert, and anyway Rally stickers will cover any bad spots, but overall the car is looking fine. Meanwhile the minor (and almost daily) dramas continued with the water pump pulley fouling the housing, which entailed much time repeatedly machining and trial fitting the pulley until it was right and lined up with the crankshaft pulley so we can fit the fan belt. Then when I sat in the car, I realized there was no where to mount any of the rally instruments, so I had to fabricate a new dashboard section that I bolted in the centre. Having moved the wiring loom inside the cockpit (except for any wires going to the engine or front lights), we installed fuses, relays and a bus bar on the firewall so they can easily be inspected / repaired from inside the car. We also have a full separate switch box mounted on top of the gearbox housing that can be quickly unplugged and unbolted if required for repairs. An emergency cut off switch, and flip switches for fuel pumps, interior lights, spot lights etc are all mounted on this panel, as is a voltmeter so we can monitor the alternator output and battery while running. Dual fire extinguishers are mounted on top of the switch box. Although all the lights etc are not yet wired up, Steve from CCC (who had installed the wiring) came over and when we connected up the battery, every switch and wire went ‘live’ in correct sequence – a very satisfying result after all the dramas and delays we had experienced with everything else! As we write this, the rear wings, mud splash guards, boot lid etc are all bolted on and finished. We are leaving the front shroud and wings off the car until we get the engine running, simply because it is so much easier to work on the engine with it all off. We are just waiting on an alternator bracket to be adapted to suit our new alternator, and then once the radiator etc are installed, we will be ready to fire up the engine sometime in the next week or so. There are still a multitude of small items that need attention, but these can be done as we move forward, and even once we are on the road. The last two major items are to build and install a roll bar, and also build and fit a full length under tray to protect everything underneath. It is certainly an exciting time. When you spend virtually all day and every day working on a project like this, when one gets this close to completion the anticipation really builds, as does the apprehension that all bolts are tight, all fittings are installed correctly, and that everything will work as intended! We are entered in the C.O.T. Rally out of Alice Springs in early August, so we will have about three months to make sure everything is working correctly. Once that is over, we have a further six months to amend anything that needs amending, repair anything that breaks, and to add anything we have forgotten before we head off for the Gobi Desert.